Is your body, including your hands, stiff when you wake up in the morning? And does it take more than your morning shower and coffee to get going? Joint protection and taking frequent rest breaks will help minimize your discomfort and challenges with hand pain throughout the day. Begin the day with warm-up stretches and flexibility work. A simple but effective stretch that incorporates many muscle groups is the prayer stretch. Hold each position at least 30 seconds to allow the muscles to fully relax. Complete this stretch several times throughout the day. When possible use a tool to do the work instead of your hands. For example, rather than tearing a bag open, use scissors to cut it open. Rather than twisting a lid off, use a jar opener. Cushion handles to reduce the forces needed to grip. Some low cost examples including using padded work or garden gloves, wrapping coban or athletic gripping tape such as those used for rackets or golf clubs or purchasing tools with a larger handle. Therapy can offer specific and personalized recommendations based on the daily tasks you are required to do a work and you enjoy when off whether it be gardening, fishing, restoring old furniture, or connecting with others on social media. 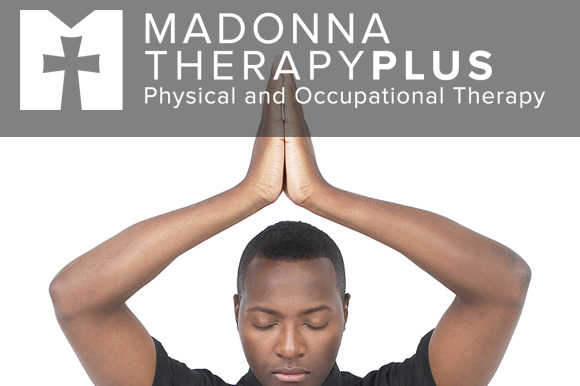 Madonna TherapyPlus has four locations with experts who combine proven techniques with state-of-the-art technology, whether you have a sport or orthopedic injury or are looking for more complex neurological therapy, you will get the results you need to get back to life, work and play. Click here to contact us.